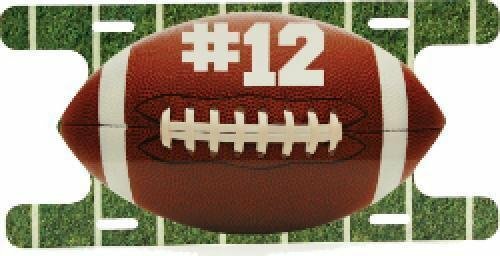 Personalize this unique license plate with your school colors and jersey number, or whatever graphics you choose to show your support and team spirit. Great for personalized gifts, promotional items or even fund raisers. Facets cut all around this molded plastic piece give it finished, higher end look. The oval holds a 2" insert of your choice that is framed at the bottom by a gold wreath design. The plate area provides ample room to personalize this award for a simple, attractive recognition of achievement. Available in 2 sizes. A beautiful faceted crystal football glued on top of a clear crystal base. There is space on the base for engraving. 3 3/4" x 3" x 2 1/2"
5 1/2" x 4" x 3"
6 1/2" x 5" x 3 3/4"
This modern resin design features a silver victory "V" embellished with gold stars and stripes that supports a full color football. Standing on a black base that has plenty of room to personalize for your event, this budget friendly award is a touchdown!